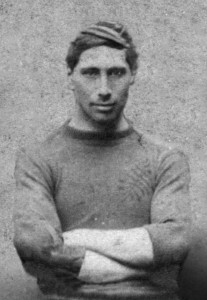 Teone Wiwi Taiaroa (1862 – 1907) – also known as John or Jack Taiaroa – is among the first of the many standout Māori players who have been a staple in All Black sides for more than a century. Jack grew up in Ōtākou and had a distinguished Kai Tahu whakapapa. His grandfather was the chief, Te Matenga Taiaroa, and his father was Hori Kerei Taiaroa, a long-serving parliamentarian for Southern Māori and a tireless campaigner for Kai Tahu land claims. He trained as a lawyer and practised in Hawke’s Bay for some years before returning to Ōtākou. Jack learnt the art of rugby at Otago Boys High School and represented Otago between 1881 and 1884. He was selected for a nine-match Australian tour in 1884 – the first rugby team to represent New Zealand overseas. Scoring nine tries in the tour’s nine games is an amazing feat given the rarity of tries at the time, and that three of the matches were against New South Wales. His try tally was twice as many as any of his team mates. All all-round athlete, Jack represented Hawke’s Bay in rugby in 1887 and 1889 and in cricket in the 1890s. In 1893, he was runner-up in the national athletics championships in the long jump for which he held a national record.